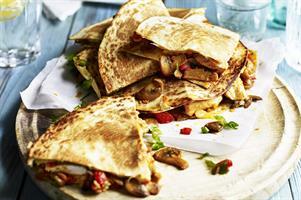 Get some Mexican flavour into your life with this fun idea for melt-in-your-mouth quesadillas. Heat some oil in a large pan over a medium heat. Add the onions and mushrooms and cook until they begin to brown, for approximately five minutes. Add the crushed garlic and red pepper and cook for 1 minute more. Add chicken, cumin, chili powder, salt and pepper and stir until all spices are incorporated. Lay a tortilla wrap on the work surface and add a quarter of the grated cheese evenly across the wrap, spoon half the chicken and mushroom mixture on top of the cheese and again spread evenly. Then add the remaining cheese before placing another wrap on top. Wipe a small amount of oil across a large non-stick pan using kitchen roll, before heating the pan over a medium heat. Carefully place one quesadilla in pan and cook for three minutes on each side until the cheese has melted and the quesadilla is lightly browned. Repeat with second quesadilla. Cut into quarters and serve.